Fairview Farm is a 170-acre wildlife preserve, and the perfect outdoor classroom! With over five miles of trails, a pond, meadows, forest, and a bird and butterfly garden, there is plenty to observe, discover and experience. This outdoor setting can host upwards of 150 students at once, with ample bus parking, picnicking areas and restroom facilities. Our historic barn complex includes a rustic nature classroom and indoor-outdoor interpretive workshop. The ADA accessible Betty Merck Science and Education Center on campus contains a children’s exploration room and a large community meeting room. Your students can rotate among up to 10 program stations throughout the day. Depending on the number you choose and the duration of your field trip, each activity can last 20 to 45 minutes. Choose fewer activities for a more intensive learning experience at each station, or more activities for an energetic day of educational fun! Start a nature journal of your very own! Students receive a blank journal that they personalize with the guidance of our staff, using art and written descriptions to document their experiences. Students take these journals home with them to continue their explorations! Enjoy a guided hike with a trained naturalist on sections of our beautiful trail system. Students will cross different habitats, using their senses of sight, hearing, smell and sometimes touch to make observations about nature. 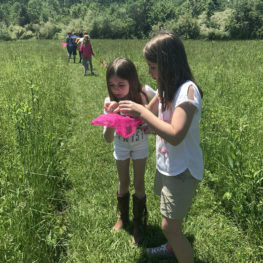 Walking around Fairview Farm’s pond or standing on our dock, students can observe creatures in and out of the water and learn about aquatic ecosystems. We provide live benthic macroinvertebrates for students to study closely, and they’ll learn to identify these creatures by comparing them to drawings in our key. Explore Fairview Farm’s bird and butterfly garden, a colorfully alive space filled with native plants that provide food for birds, nectar for butterflies, leaves for caterpillars and habitat for hundreds of species of pollinators and other critters. Students are invited to “become” butterflies and learn about migration through a fun, hands-on game. Students learn how aquatic animals have adapted to their unique environment, and use creativity to design an imaginary creature perfectly suited for a watery habitat. Students learn about the water cycle–a critical concept in watershed conservation–and find out about how the cycle may be changing as a result of climate change. In a fun, energetic game, students become water droplets traveling through the water cycle. Students examine the composition of different soil types found in New Jersey to learn what soil is made of and how soil type affects vegetation and habitat. Children will see a real-life display of worm composting, learning how these creatures help organic materials degrade into soil! Explore the forest floor in our outdoor classroom, looking under logs, stones and leaves to find and identify hidden creatures! 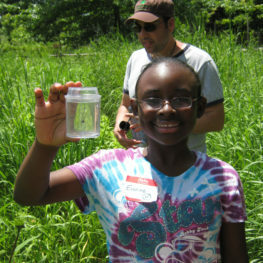 Compare the shapes and life cycles of these insects to those we find at the “Pond Ecology” station. Working in pairs, we’ll get a closer look at trees using our senses. By interviewing a tree and imagining its “life story,” students will creatively explore why trees are so important to humans and how we relate to them. Explore Fairview Farm’s beautiful meadows, examining different types of grasses, herbaceous plants and wildflowers. We’ll study the different types of plants in this unique and sensitive habitat, and discuss their similarities and differences. Through a hands-on activity, students examine different ways soils can be eroded. They’ll learn how proper stewardship of the land results in less erosion and better ecosystem health. Learn about some of our native feathered friends, their life cycle and their role in the ecosystem. By taking a close look at taxidermy specimens, feathers and bones, we’ll learn about these varied and amazing birds and how they’ve evolved. $100 per class (up to 30 students) for a 3 hour program. Scholarships are available.